This is what everyone had been waiting for: International Night. It was a great experience for everyone. Everyone was in their traditional dress, and there were performances of traditional dances, songs and games. Around the outside of the ballroom were tables where each delegation could set up a display about their country or their council. 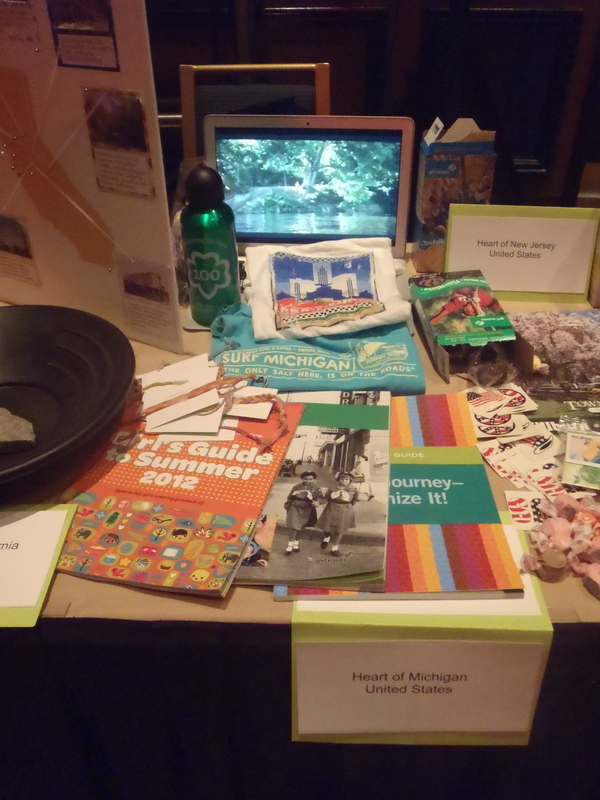 Here was ours, we had a slideshow with pictures from Michigan and the Pure Michigan tourism ads, and some Surf Michigan and Girl Scout t-shirts. GSHOM also gave us a Source book and a camp book. We shared table space with Heart of New Jersey, Heart of California and Historic Georgia. International night was an amazing sharing of cultures, traditions, and of course swaps! There isn’t much to say that I couldn’t better show you in a picture, so here are some from the night. As I write this, I’m about two days behind the actual conference. I just got back from the closing celebration/dance party. Don’t worry, I will finish going through all the days, I just wanted to say that I have had an amazing time at the Girls’ World Forum. I learned a lot about myself, my girls, WAGGGS, and so many awesome things that girls and women around the world are doing. But before I get too deep into that, it’s time for bed, I will write more about what I learned here when I wrap up. Don’t for get to comment and share with your Girl Scout friends! Can’t wait to read about your experiences. I picked up my daughter from the airport & she was exhausted & full of stories to share….when she wakes up! She was the girl wearing the Buckeye necklace…. Awesome! That’s just how the girls and I felt when we got home last night, it was an amazing event but so tiring!